Paladin is listed on the Australian Securities Exchange, Toronto Stock Exchange and Namibian Stock Exchange under the symbol PDN. 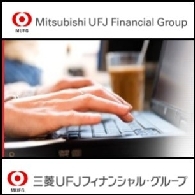 The Company also trades on the Munich, Berlin, Stuttgart, and Frankfurt Exchanges under the symbol PUR. 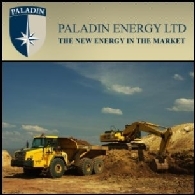 Paladin is a uranium production company with projects currently in Australia and two mines in Africa with a strategy to become a major uranium mining house. 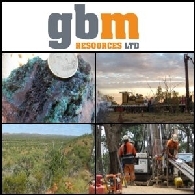 Australian resources company GBM Resources (ASX:GBZ) announced it has entered into a Share Acquisition Framework Agreement with state-owned enterprise Jiangxi Centre Mining Co Ltd (JCM), an entity owned by Jiangxi Provincial Bureau of Coal Geology, formalising an investment in GBM for strategic investment and partnership. 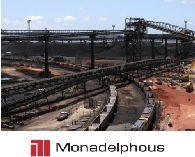 The Australian market opened slightly higher on Tuesday. Wall Street posted modest gains overnight as investors focused on the company earnings reports and shrugged off the weak housing data. 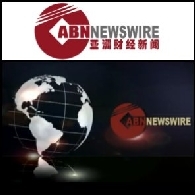 The Australian sharemarket sharply fell on Wednesday with all sectors in the red. At the close, the benchmark S&P/ASX200 index lost 73.3 points, or 1.6 per cent, at 4644.6 points, while the broader All Ordinaries index fell 73.1 points, or 1.5 per cent, to 4670. Wall Street closed modestly higher on Tuesday after positive US economic data. Meanwhile, the Federal Reserve chief Ben Bernanke also said the "recession is very likely over at this point". US retail sales were surprisingly strong in August largely due to government&apos;s "cash for clunkers" program, but analysts warned that it may not represent a sustainable recovery in consumer spending. Overnight US stocks rose for a fourth consecutive session led by industrial stocks. But market sentiment were dented after Federal Reserve report showed that consumer spending was still soft and retail sales were flat. The report also said labour market conditions remained weak across all districts. 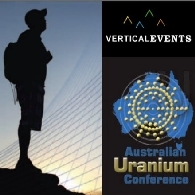 2009 will be an interesting year for Uranium in Western Australia. 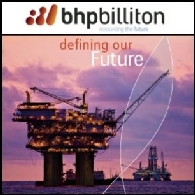 The change of Government has led to uranium exploration and mining being back in favour but the financial crisis has led to a lack of funds being available for exploration. However the outlook is positive. Uranium usage is tipped to increase with China and India leading the way and Japan also active in the sector. 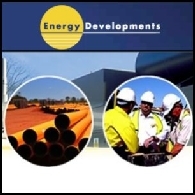 Energy Metals (ASX:EME)(PINK:EYMTF), as manager of the Bigrlyi Joint Venture, is pleased to announce the results of an in-house Updated Scoping Study recently completed at the Bigrlyi Uranium and Vanadium Project in the Northern Territory. Resolute Mining Limited advises that it has sold 15.6 million Paladin Resources Ltd shares for cash consideration of C$79.8m. This was the remaining balance of its Paladin Resources holding following the sale announced on 4 October 2006.